The tiny island of Culebra is located 17 miles east of the Puerto Rican mainland. Culebra was once the site of the Culebra Naval Reservation. During World War II and up until 1975, it was a U.S. Navy practice site for gunnery and bombers. The island has been recognized for its rich natural resources since 1909, when a bird refuge was established here. The U.S. Fish and Wildlife Service took it further by declaring 600 hectares of the surrounding area the Culebra National Wildlife Refuge, which consists of majority of Culebra and the 23 islets surrounding it. The refuge is home to over 85 species of sea birds and nesting sea turtles. Another nature preserve is Mount Resaca Refuge, which protects the last few areas of dry sub-tropical forest on the island. 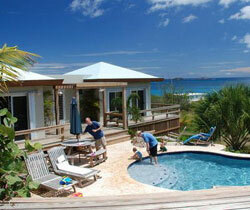 The major cays of Culebra boast their own respective tourist attractions. Culebrita, found in the largest cay, is famous for its fine white sands and excellent water visibility. It is also home to the Culebrita Lighthouse, which has been registered in 1981 as a historical monument. The second largest cay, Luis Peña, is the location of beautiful coral reefs that are frequently visited by snorkelers. Its most famous beach is Marajeda Beach, also known as Turtle Watch Beach because it is the home of huge leatherback turtles, which can grow as heavy as two tons. Luis Peña Cay was a favourite hideout of pirates in the 18th century. For swimming and snorkelling, the best beach in the region is Flamenco Beach.